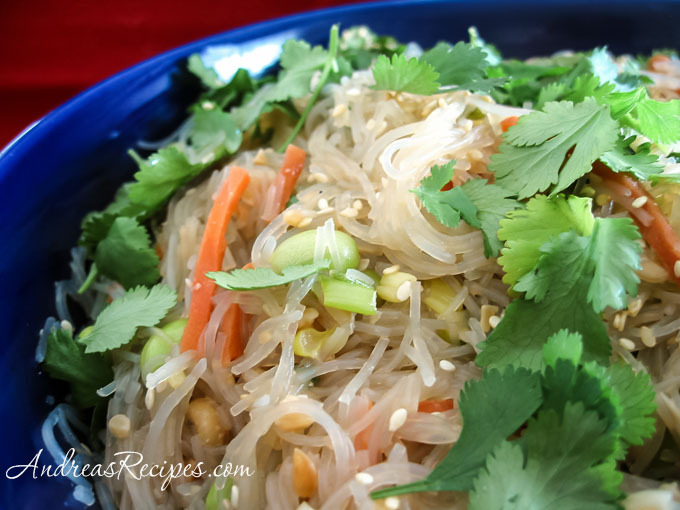 We love noodles cooked just about any way, and I find that noodle dishes are a great way to get my boys to eat their vegetables. This is a dish that I find particularly refreshing in the summertime. I can walk in the door after a hot morning outdoors with the kids, pull this out of the frig for lunch, and it will absolutely hit the spot. We love the slippery bean threads. There are many variations on cold sesame noodles, and this is just one of several that we like. I prefer to use bean threads for a more Asian touch, although you can certainly use thin spaghetti. The chopped peanuts lend a nice crunch, and the edamame adds a vegetarian protein boost so that you can actually make a meal out of this. I like to squeeze a bit of lime juice over each serving for a really fresh taste, but I’ve found that using too much lime overpowers the sesame flavor. So go for the lime, but go lightly. 1. In 6-quart pot, bring about 4 quarts of water to a boil. Cook the noodles until al dente. Drain in a colander and rinse briefly under cold water. Drain the noodles well, then pour into a bowl and toss with 2 tablespoons of the sesame oil. 2. In a large skillet over medium heat, cook the carrots and edamame for 2 to 3 minutes in the remaining 2 tablespoons of sesame oil. Add the scallions, garlic, and the red pepper flakes and cook, stirring, until the scallions are just softened. 3. Add the noodles, vinegar, sugar, and soy sauce and heat the mixture, tossing to combine it well, until the noodles are heated through. Stir in the peanuts and refrigerate until chilled, at least an hour. Remove and add chopped coriander and sesame seeds. Salt to taste. Transfer the mixture to a serving bowl and garnish with cilantro leaves. Squeeze a little lime over each serving. Bean threads are very lightweight, so if you try compared equal weights of both, you would see that 8 ounces of bean threads gives you a lot of noodles compared to 8 ounces of thin spaghetti.